Bedhead in melamine finishing with 20mm width timber strip painted in the matte black finish. The package can be adjusted according to your room dimensions, and the cost will be adjusted accordingly. Note: Product installation includes carpentry work. Product images are for illustrative purposes only and may differ from the actual product. 1. I would like to order a bedroom bedhead - how does it work? Meet - Meet someone from our team (either at our office or on-site) and bring your floor plan. 2. What services are included? We will provide measurement and installation free of charge when you order a bedhead from us. 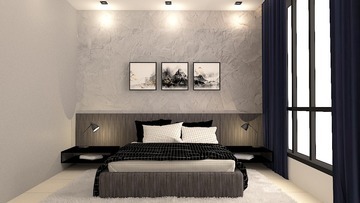 However, if you require customisation to the measurements or materials, or require creating 3D drawings, we will collect a 10% deposit upfront which is fully offset from the cost of the bedhead. 3. How do I make payment for my bedhead? Payment can be done via online banking or cheque using our Recommend Pay system. We would require 100% upfront payment, for the amount of RM10,000 and below. 4. Do the bedheads come with a warranty? All our bedheads come with a 3-year structural warranty (e.g. manufacturing defects, product failure), but this does not include wear and tear (e.g. water damage, stains from chemicals, scratches or dents from impact). We also provide automatic insurance against property damages, theft and up to RM100,000 public liability insurance for the duration of the installation. Within the first consequent 3 years after the installation, the first service comes FREE. For any manufacturer defects, it needs to be claimed from the respective manufacturer. We are happy to help you in scheduling and getting feedback from the manufacturer. For the one time free service, the date and time are subject to the availability of the team. 5. What if I need service after the warranty period is over? We are always happy to provide service for your built-ins and will charge minimal labour and materials fees when you call us again. 6. I can't find a design that I like. Can you customise one for me? Of course! Click “Book free consultation” on any of our designs and we will call you back. We’re more than happy to walk you through our favourite designs and what we think you would love. 7. What materials are your bedheads made of? If you are interested in any other material, let us know and we will see if we can incorporate it into the design! 9. How much can I customise my package? 10. I have an existing bedheads but I would like to dismantle it - can you help? Yes we can! We will need to inspect the area before letting you know how much it will cost. Do send a picture of your existing items to our consultant for a quote. 11. I also need to re-layout my living toom- can you help? 12. Once I order something, can I change it? Changes can only be made prior to the “Finalisation” stage. After that stage, the factory may have already started building the item so changes may not be able to be accommodated. But do let your design consultant know and he and she can make a quick call to the factory to let you know what can or cannot be changed. Please note, once the document with the quotations and designs are signed by the client, no changes can be made. 13. How do I take care of my bedhead such that it lasts a long time? For base materials that are made from melamine: Avoid exposure to water and spillages. Ensure that all spillages are wiped up almost immediately. For suspended cabinets, avoid overloading beyond the rated weight limit. Wet a cloth with warm water and a little dishwashing detergent (avoid corrosive or acidic cleaning agents).